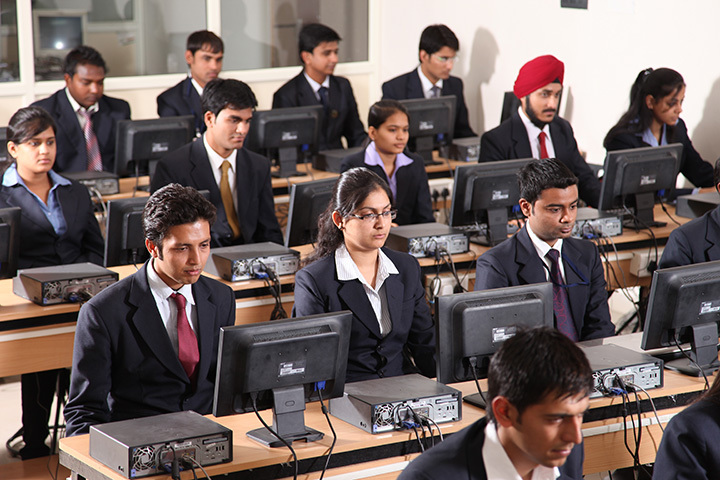 PIMR Air Conditioned Computer Lab is well equipped with computing resources to cater to the technological needs of the Institute. The campus of the Institute is Wi-Fi enabled and the Computer Lab has 726 terminals. To meet the printing needs of the members of the PIMR fraternity, the Lab has 42 printers which include Laser, inkjet and dot matrix printers. Besides these, the Lab is also equipped with scanner, LCD projectors and CD writers. LCD/ DLP projectors are also mounted in all the classes. To cope up with interrupting power, the technological infrastructure at PIMR is backed up by 15 KVA UPS, Digital Line Conditioners, CVTs and a powerful 64 KVA generator. The Lab is available to the students for more than 12 hours a day. The Institute has also provided Laptops to its faculty members. To meet the communication needs of various members of PIMR fraternity, the Institute has an Electronic Private Branch Exchange (EPBX) with 64 lines scalable to meet the increasing demand. Interactive White Boards: The Institute has provided two interactive white boards for class room teaching. Video Conferencing Facility: The Video Conferencing Faculty has been installed in the Institute using a Static IP address and Polycom Camera facility and is connected with Dewas, Gwalior Institutes. Language Lab: The Institute has developed an English language lab to provide training to the students to overcome any inhibitions in the language and expose them to the corporate communication. Central TV : The Institute has also installed a central TV which is used for constant screening of CNBC to ensure that students are updated on current business environmental trends.